What a delight this film is! A wonderful story, some captivating performances and the spirit of post-war Guernsey sensitively portrayed. Pity so little of it, if any, was filmed in Guernsey! Hopefully it will boost tourism with more people discovering the riches this isle and its people have to offer. I have had the privilege of visiting Guernsey dozens of times - initially as a 9 year-old on holiday! The effects of the occupation are still a vivid and lived reality within the culture of the Channel Islands today - just visit on May 9th - Liberation Day, which is a public holiday in the islands if you don't believe me! This film has a very English feel to it although some expressions of Guernsey French do find their way into the dialogue. 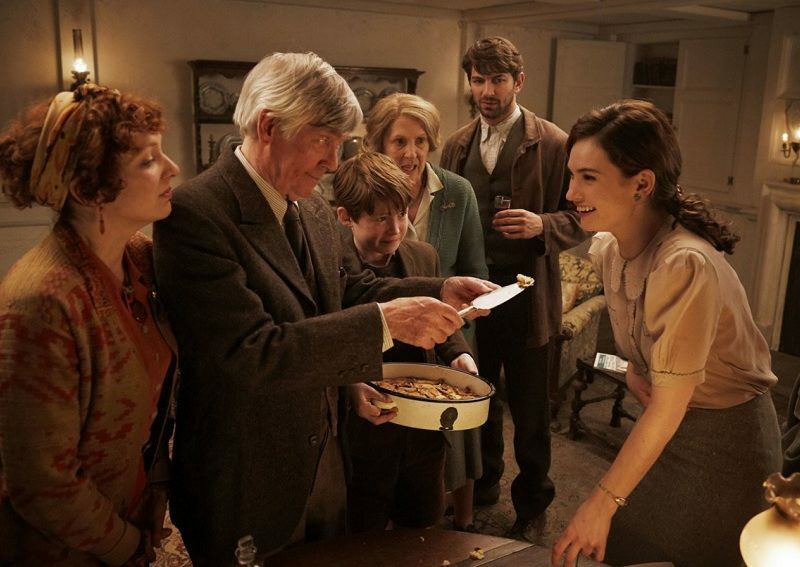 The casting of Lily James as writer Juliet Ashton, Matthew Goode as publisher Sidney Stark and Penelope Wilton as embittered widow Amelia Maugery is inspired and their performances - especially Wilton's worthy of a major award. The film is based on a novel by Annie Barrows and Mary Ann Shaffer. This film depicts some of the horrors of war and of being on an occupied island when the occupier takes all the good stuff and leaves the locals to live on potatoes. The slaves imported to work on building coastal defences fared even worse. It also gives a tender insight of when the rigid distinction between occupier and occupied become blurred reminding us that humanity and love can survive in even the harshest of situations. This is a film about emotions - love, hate, hope, regret, fear, unknowing, grief, courage, betrayal, loyalty, grace and generosity. The central characters are still enmeshed in a web of consequences flowing from war time events - the film is set only a year after the end of the war and those emotions are still so raw. As the islanders are still learning to enjoy their freedom, so the central character appears to be blindly heading for her own captivity as a trophy bride for a rich and ambitious American diplomat. Issues of gender equality are explored both through the writings of the Bronte sisters and through the lives of some of the characters in the film, which brings it right up to date. This film had me snuffling at many points - I found it moving and engaging. I know that reviews have been mixed. I can only guess that the negative comments are from people who have remained objective and detached, and not allowed themselves to be drawn in by the characters and the story. Isn't cinema supposed to offer that invitation to viewers? It worked for me. This film is a heart-warming and nostalgic tear jerker that allows a privileged insight into the sufferings of Channel islanders during WWII, which outside those islands is largely ignored. It's also a well told, well acted and nicely shot story that tugs at the heart. Do go and see it - but take your tissues! I'll give it 9/10.